You know when you just love a colour so much that you decide to base your entire outfit around it? Well that's how I felt about powder blue for this particular outfit. As you know, pastels are my favourite and pastel pink and powder blue are my two ultimate faves. I bought this powder blue midi skirt from Primark a while ago and I love everything about it. 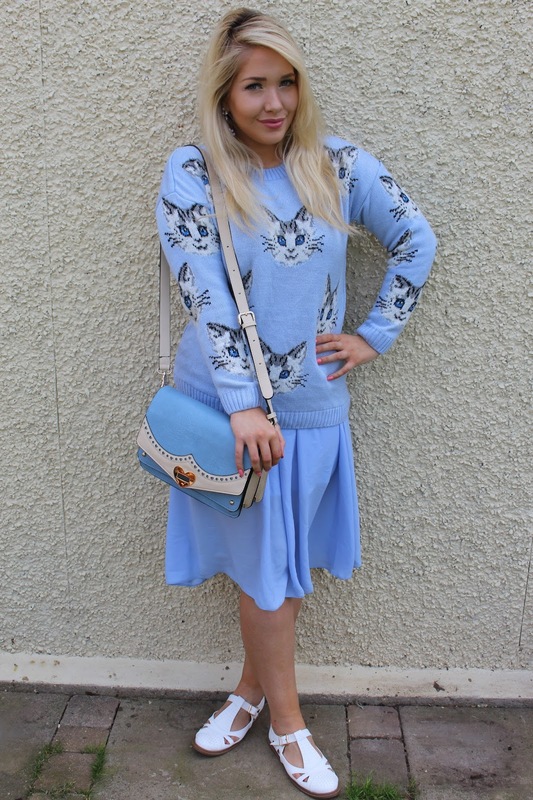 I thought I'd pair it with this cute kitty jumper I was sent from WearAll and my Boohoo dolly shoes. To accessorize, I thought I'd stick with the blue theme and show you guys my beautiful Anna Smith bag from LYDC, which is seriously one of the cutest bags I've owned. In pale blue and cream with love heart detailing, it is the perfect size for keeping everything I need in whilst not being too big to lug around with me. It also has two sections which is pretty handy for a smaller-sized bag. I also thought I'd keep the blue theme running through to my jewellery, which in this case is a stunning pair of statement earrings from Vintage Styler. I know a few of you spied them in my spring makeup post a while ago and they went down pretty well, so I had to feature them in an outfit post. They are the perfect statement earrings and I feel ridiculously classy when I wear them. What do you think to my ultra powder blue ensemble? Are you a fan of going all-out with a colour when you love it?